Whew, I'm pooped and could use a long hot bath like Betty here, but I have to wait one more day. to run on that day and kept checking in on the website. to all of you who entered or even just visited my shop. to see if you are a winner! so check back often to score a deal. 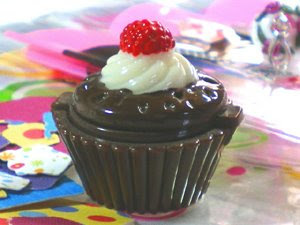 Cupcake Giveaway #2 is in play, for ONE DAY ONLY, on Tuesday, May 26th! Contest runs until May 27, 8 a.m. Mountain time. You MUST ENTER AT THIS SPONSOR WEBSITE: Give Away Today. 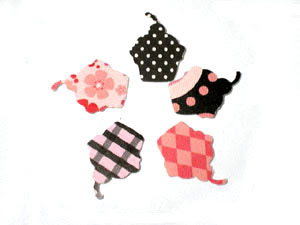 3 big fat prizes are available and you'll have 3 chances to win one of them, pictured here. 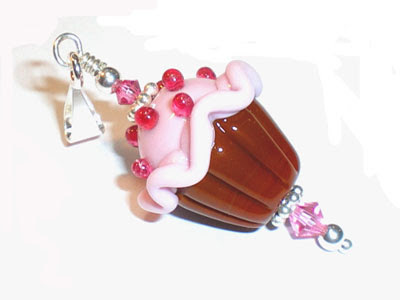 During this giveaway, I will also have a SALE through May 31st: 15% of ALL Cupcake jewelry items AND FREE SHIPPING, so it's more like a 20% discount! Click HERE to select your cupcakes. so that all payments will be cleared. So come back on Tuesday to join in the fun! After this weekend holiday is over, be sure you come back here on Tuesday the 26th as I have a BIG FAT announcement to make that every single one of you is going to love love LOVE but it's only for the one day, so I recommend subscribing to this blog (over there on the left) in order to receive an email reminder. Things are lightening up around here. In sync with my previous post about Mom's apron, I was cleaning my makeup container today and realized it's completely in line with the new decorating scheme I'm creating in my home. This carousel is a planter that my mom received as a gift when I was born. 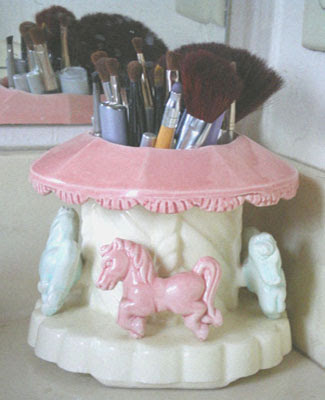 I have always loved it, with its cream center and pink & aqua horses. It's a treasured object for sure. I like to have it out and usable but am paranoid about handling it as it is irreplaceable, so it sits in the corner of my bathroom vanity area. On the bottom, it is stamped "Copyright by Conrad Ceramics, 1957, Santa Ana, California". Today as I was sprucing it up I thought, hey, these are the exact colors I am starting to work towards for a remodel of my current living room and guest room furniture. I'm doing it slowly and cheaply over the next year or two in preparation for our move to a retirement condo near the ocean. I didn't want to wait until then to do an entire pricey remodel so I thought I would just buy sweet items here and there and almost always on sale. 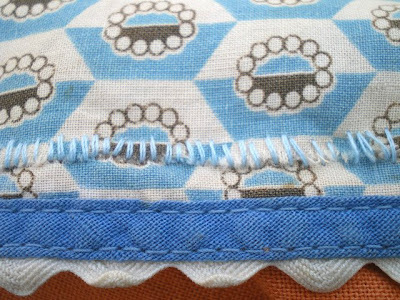 This way I can introduce and mix it into our current brown color scheme and then squeeze the brown out eventually, with the final step of reupholstering the sofa & chairs. Here is my inspiration picture. It even has one of my favorites, wainscotting! 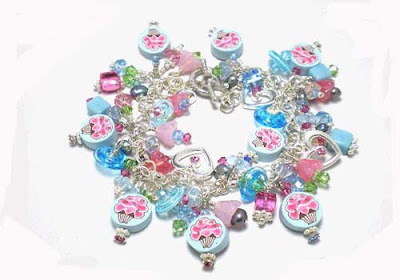 In fact, for those of you who have seen my Fully Loaded Cupcake bracelet, this picture helped me figure out its design. I had beads in pink and aqua but needed a third color, so I pulled out this picture, and there it was...green. So, take a peek again at the carousel above and you'll see it has all these colors except the green, which will be sporadic in my home...just a little pink and green to offset the aquas & creams. 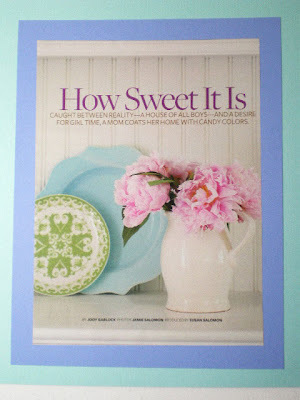 I pulled this picture out of a home magazine and used some of my confetti papers to double mat it in green & blue. I visited Pier 1 imports last week hoping to find a pillow or two with blues to play off my brown furniture...didn't find the right colors. 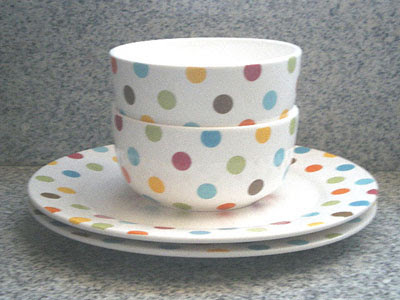 I did, however, find these bowls & plates, perfect with my new scheme. They were a wonderful surprise and right in my price range: $4/bowl and $5 plate. 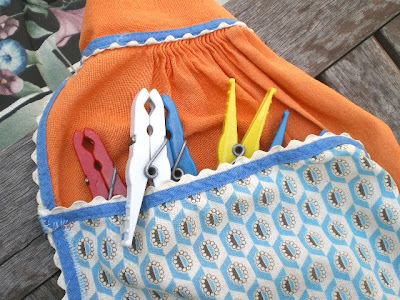 I don't like to go higher than that which usually puts me in a pretty dull color range but these are great! 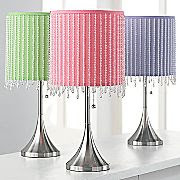 And JC Penney has these fabulous beaded lamps that I'm going to use for inspiration as well, since they come in all 3 colors of my new plan. I think I can get a base & shade cheaper as separates and do my own beading, but we'll see. So, looking at my boring brown furniture and pillows below, you can see how much we are lightening up around here. 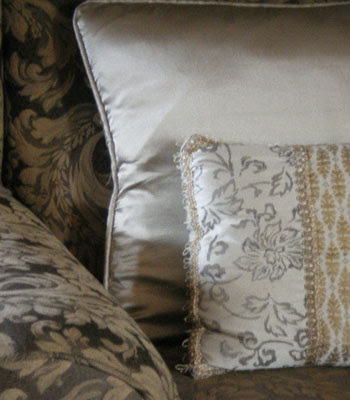 Yes, the patterns are nice and certainly not ugly, but there is just waaaay too much brown in my home. Way too safe a color. Feels good to freshen things up. Check out this wonderful giveaway for some amazing beads from Blu Healer Glass that Fab Fibers is sponsoring by clicking "Fab Fibers". Had a cup of coffee with my sweet friend, Lisa, today. Hadn't seen her in several months and she had ordered a pair of my Signature earrings and wanted to peek at some cupcake jewelry. I made it fun for her and took my entire container of cupcake beads for her to "shop" through...thought it would be a lot more fun than just looking on line! It was so nice to chat about families and get generally caught up on what we are doing. We need to do it more often, but doesn't that always seem to be the case? I get to see my other friend, V, next week for lunch and a movie. Wolverine, baby! I could use a tough Hugh Jackman fix. I've seen him recently on quite a few talk shows and he looks so clean and is funny and sweet and glorious to look at, but he is NOT Wolverine in real life...funny, that. I need his gritty, clawing side. Yum. So we finally got a new umbrella since the previous one was comPLETEly thrashed. Our local hardware store had this 9 footer for $49! It's not the heavy duty canvas type (which cost 3x as much) but it cranks open which I like and it can be angled. If we keep our bricks cool and shady, it helps keep the bottom floor icy cool in hot weather. 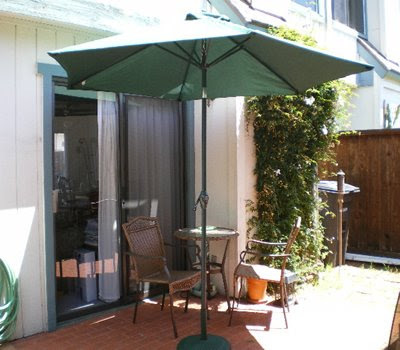 Isn't it pretty here with our bistro table & chairs and the jasmine vine in the background. Nice! I will be visiting my Godson in Napa next week, so I'm not sure when I'll post next, but be assured, there is my friend's surprise bracelet yet to show you (think Paris colors: pink, black & white) and I should have a new piece assembled by then for you to purchase as well. 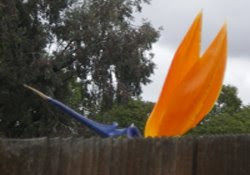 For your Friday entertainment, here is a complete series of the fabulous Bird of Paradise making its attempt to peek into my yard. 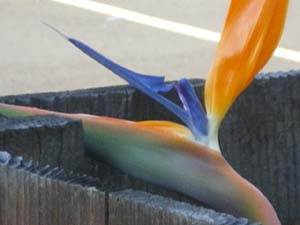 I know some of you don't like this particular flower but I find ithe progressive opening of its "beak" to release the orange blossoms quite fascinating. Each day I would happen to look out there and say "oh man, look at the sunlight coming through that orange!" and I'd grab my camera and click. Remember Robert Redford in "The Electric Horseman" getting angry at Jane Fonda for joining him out in the country with her ridiculous boots from "BloomingBirds"? (instead of Bloomingdale's). I thought of that as I was naming this post. Ah, Redford when he still had long hair and that amazing mustache...yum. Ta-da!!! Look at that beak now! 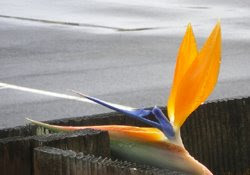 Completely open to show, sheesh, what...9 petals that were hiding in there???? Beautiful...happy Friday to you. Did any of you have an idea it would turn out this way? Okay, so now that your curiosity has been quenched and I can say "whew!" that project is over...what next? 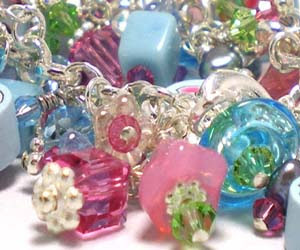 I'd like to work with some hummingbird clay beads I got but I'll see which ones inspire me the most. I have a glass artist friend that deserves a gift so I'll be working on that as well...you won't know who you are until you receive it! I'll be happy to show everyone once it's completed. And now for the "goings on" in my yard, we have doves that visit each spring and this year's pair is so comfortable that one of them let's us get reaaaaally close. Most of the time I don't even SEE them until they suddenly fly away because I'm almost on top of them! 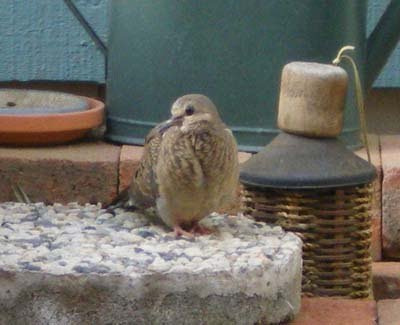 They love to fluff their feathers and rest on the brick that warms in the sun as in the photo below. They let me snap pic after pic too which makes it a lot of fun for me. 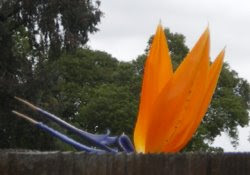 Lastly, my neighbor has Bird of Paradise flowers blooming in her rear yard and this one looks like it's trying to peek over the fence into my yard. 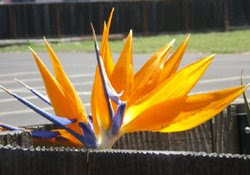 I have to remember to photograph it through to its full bloom. Doesn't "she" look like a creature of some sort? I love it. I'll have a newsletter announcement towards the end of the month so be watching for that and I'll be back as soon as I can with another beauty for you to go "ga-ga" over.